Through interaction with your smartphone and experience augmented reality, consumers could try the new Smartwatch Gear S2 and also make a profit on the purchase. Consumer impact. Achieving to capture not only with the product, but also help you feel the sensation of having a device even if you have yet not yet purchased it.Surprising the user in a retail outlet. This was an experience that allowed Samsung to attract various new customers. 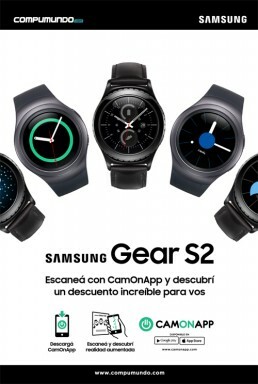 The new Gear S2 was the star of the campaign that made the Korean and CamOnApp company. 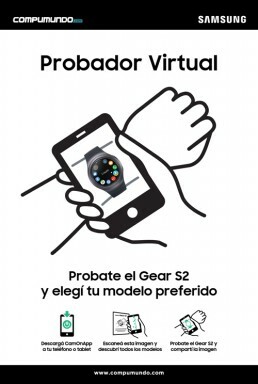 Users who visited various retail stores could test the new model smartwatch thanks to the augmented reality platform. 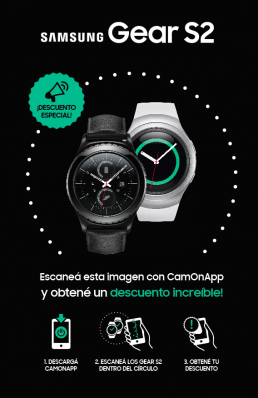 When scanning a graphic piece, consumers could prove how they had left the watch on his wrist and feel the first sensations of having a Gear S2 above. They were interchangeable screen layouts to customize them according to the occasion and customize the screens that come with the product in order to choose a favorite. On the other hand, some stores were dressed in shelters that were also feasible to be scanned and so consumers could get an instant discount of $ 1000 (in Argentina) buying the product. This was one of the first experiences that become interactive to the outlets in a simple way and in a very short development time. CamOnApp allows experiences to be created on its platform in an efficient manner, so that manufacturers can provide consumers the opportunity to discover new benefits from interaction with their smartphones. Download CamOnApp from the App Store or Google Play and find out more augmented reality experiences.